Welcome to the Year 6 Web Page! What event is the image above depicting? When was our country last invaded? Spellings recorded in your spelling log must be learned. Parents should test you and sign the page to show this has been done. If you don't have any recorded, learn some of the Y5/6 orange words at the back. Maths learn-its sheets are also sent home each Friday after the test. You should make sure you practise these so that you can improve your score which will help your arithmetic skills. Our Spring 1 topic had a geography and science focus: Frozen Kingdom. How cold is at in the Antarctic? Why? Who won the race to the South Pole? How do animals and people survive in the most hostile parts of the world? A bit of Design Technology in the playground using Jenga and teamwork! Our topic for Autumn 2 was the World Wars. The centenary of the Armistice was at the centre of our thoughts as we studied the impact of both world wars at home and abroad. What a fantastic wartime menu we rustled up during our evacuee day! Sandwiches (with some interesting ration-friendly fillings), vegetable soup and home-made bread. Mrs Purvis gave up her time and the kitchen too, thank you! We also had a fabulous workshop with Matthew Bellwood on the 'Home Front' finding out what life was like in Britain during WWII. 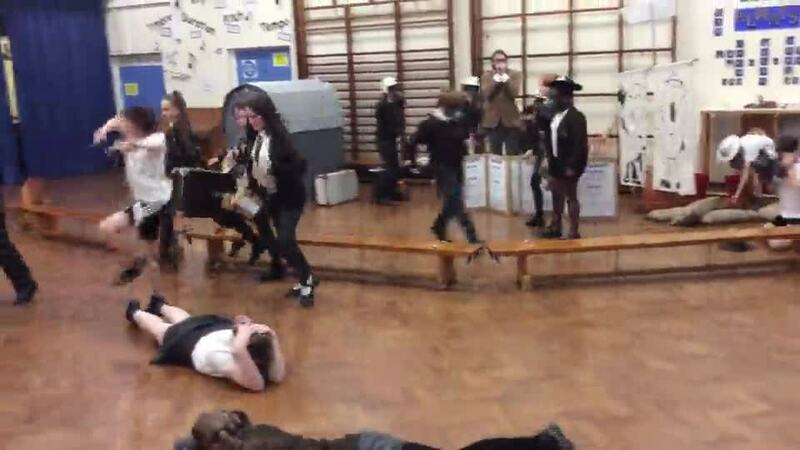 Our video shows some of the things which would have happened in an air-raid. We placed our poppies in our seating circle to help create our school garden of remembrance. Visiting the Brighouse War memorial helped us understand the sacrifice made by local people and we recognised familiar surnames amongst them. Joining other primary schools at the Central Methodist Church, we remembered those who gave their lives. We had a visit from Shantha Rao from Annapurna Indian Dance. She taught us about the 1.1 million soldiers from the Indian subcontinent who fought for the British Empire in WWI. 75,000 lost their lives. It was a moment to remember the sacrifice that stretches across the world. We also joined in with some Indian dance to celebrate the peace we continue to have and hold dear. Our Topic for Autumn 1 was I.D. We thought about what makes us unique and the special qualities and skills we all have. The book 'The Goldfish Boy' by Lisa Thompson formed the basis of some of our English work. This novel tells of a young boy's struggles to deal with his anxieties as he also tries to solve a worrying mystery. We were hooked! In science, we learned about the body: the circulatory system; how drugs affect our bodies; and what we can do to live healthy lives. We had a visit from CSI Hollie, (Crime Scene Investigator) who explained her work. We examined our fingerprints and dusted for prints too. I think she inspired many of the class to think about forensic science as a future career! 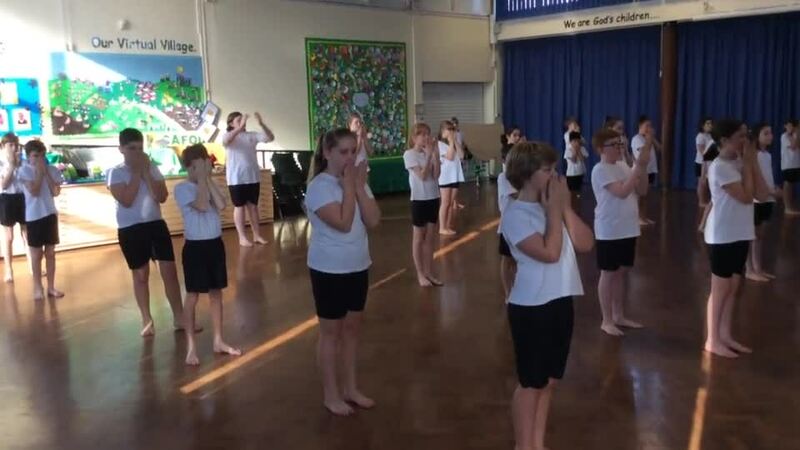 Our PE topic for Autumn 1 was DANCE where the class use dance to express identity. Please view our video above. Reminder indoor PE kit needed in school each Wednesday. At the buddy assembly, Year 6 officially welcomed all the reception children to our school family. They placed their bead, which represent each member of our school community, into the heart shaped basket. We had a little party afterwards too! Year 6 have helped our new children settle really into the St Joseph's school family. The pictures below also show the first time we all met and chatted together. KEPPLEWRAY MEDICAL FORM (COPY BELOW) MUST BE COMPLETED AND SENT INTO SCHOOL BY 12TH APRIL BEFORE EASTER HOLIDAYS. ANY WORRIES YOU HAVE OR THINGS WHICH CHANGE LEADING UP TO THE RESIDENTIAL, PLEASE CONTACT THE OFFICE/SEE ME. Have indoor and outdoor PE kit including trainers. We have already begun to learn about the 7 good habits of leadership. Plus, we will learn about 'emotional bank accounts'. Do we deposit or withdraw? We investigated if light travels in straight lines. Would light rays travel through the holes in a row of cards? We also investigated how to change the size of shadows. Using a prism, Sir Isaac Newton discovered white light is made up of all the colours of the rainbow. We spun a colour wheel to see this. This year's focus was permission and consent. Think about the consequences of what you post, text or email. Have you got permission? Do you need consent? Thank you to all relatives who came to our Christmas craft afternoon. We took part in BBC Learning Live, joining many primary schools across the country to learn more about WWI and remember. Our question was one of only three chosen to discuss and we were very excited to see our name on screen. Thank you for the fabulous poppy exhibits which will be displayed at Halifax Town Hall during remembrance week 5th - 9th November. See leaflet below. Some of our artwork developing our sketching and observational skills. 12th April: 1-3pm. Y6 will walk to church on 'pilgrimage' as part of Faith in Action and Fr Michael will lead us in Stations of the Cross. 13th May: SATS week. Breakfast club Monday - Thursday for Y6 from 8:30am (no charge). Usual breakfast club also running in the hall. We will look at Jesus' miracles and what they tell us about Him. The events of Holy Week will be viewed from different perspectives and we will discuss whether Jesus was given a fair trial. As we journey through Lent, we will reflect on how we can be better follower's of Christ as we prepare for Easter. Father Michael came in to help us understand 'The Eucharist' in more depth. He brought the monstrance (which is used in adoration of the Blessed Sacrament) and explained what happens at the consecration during mass. Thank you Father! CAFOD IS OUR CHOSEN CLASS CHARITY. PLEASE SEND IN ANY LOOSE CHANGE YOU HAVE FOR OUR CLASS COLLECTION BOX. EVERY TERM WE ARE ORDERING ITEMS FOR OUR VIRTUAL VILLAGE, HELPING OTHERS IN NEED AROUND THE WORLD. Our CAFOD day raised £60.00! Thank you all so much. Procession & Pilgrimage (e.g. going to a sacred site or place of pilgrimage e.g. Kirkstall Abbey, attending the Batley Torchlight, attending a May Procession, Remembrance service). Social Action (e.g. raising money for charity, donating to a food bank or charity shop). Each half term, as part of their Faith in Action, a different group will focus on planning whole school worship and fundraising (for our chosen charity CAFOD). So far, we have raised £90.00. Well done and thank you! We will learn about links between the Passover, Last Supper and Eucharist. We will learn more about the mass: the parts, actions and symbols as well as how the Eucharist gives us spiritual food to live our lives as followers of Christ. We learnt about Jesus' teaching and how as Christians, we should treat everyone as our neighbour. We focused on the work of our chosen charity CAFOD and also found out about the life of Oscar Romero, who worked for justice in El Salvador. It was inspiring to learn about Malala Yousafzai, the young girl who continues to fight for female education, despite an attempt on her life. Our RE topic 'Called to Serve' supported preparation for the sacrament of confirmation which will take place within the parish. How do we serve God in our daily lives? What does it mean to be a Catholic Christian? How do people show their service to God and others? Canon came to talk to us about his 50 years of service as a priest and what this means to him.